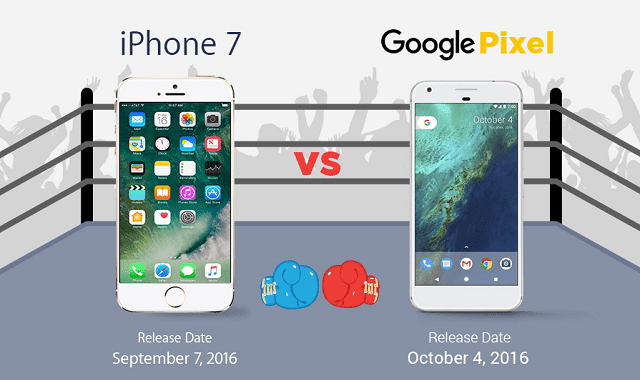 Google Pixel Vs iPhone 7 - Difference and Comparison #Infographic ~ Visualistan '+g+"
Today, If you looking to buy a new smartphone, you have to choose between Google phone and iOS. It's always a difficult task to comparing a Google's phone and an iOS because both devices have their own pro and cons. Google has recently launched Pixel & Pixel XL (first smartphone designed and developed by Google itself), it's a brand new handset packed with plenty of Google magic such as 5.5-inch quad HD display runs at a resolution of 1440 x 2560 pixels, 12MP rear camera, Snapdragon 821 processor, 4GB or 32GB of RAM and 128GB of internal storage and more. While Apple unveiled iPhone 7 and 7 plus with wireless headphone, water resistance, dual-lens cameras, Stereo sound, faster processors, long battery life and more. Google Pixel and iPhone 7 dominated on the current market by offering unique features. Therefore, the competition between both smartphones is higher than ever. Both users (Google and iOS) take pride of their selected platform and believing that theirs is the better ecosystem. So let's decide the strengths and weaknesses area by comparing the Google Pixel and iPhone 7 on major aspects of specifications.